When it comes to optimising floor area Rachael’s Eco House design seems to conjure more living space than the average home of similar size. Otherwise known as “practical area displacement” meaning more, given creativity beyond the mere functional, the essence of a good design. 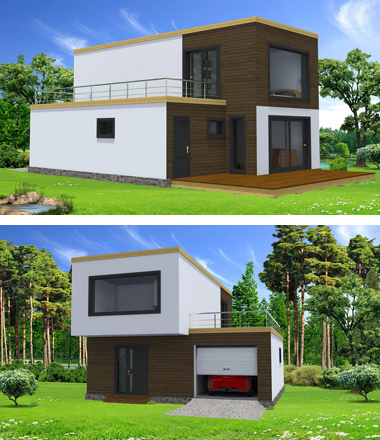 The contemporary minimalist design of this Eco Home lends itself to urban settings with choices of exterior / interior finishing and free bespoke flexible floor plan to suit. A foot thick insulation between its post & beam, triple glazing as standard as well as some of the best home features anywhere. Our modular timber frame construction ensures the house is erected in days to wind & water tight stage. We liaise with your after trades towards speedy completion, ready to occupy in few weeks. In an age where home ownership is the stuff of dreams, we shall work with you making it real, affordable & hassle free.